The biggest reason for the surge? The immense demand for lithium-ion batteries needed to power electric vehicles (EV), cell phone and wind turbines. China, which produces most of the world’s lithium batteries, has moved aggressively to secure a steady supply. 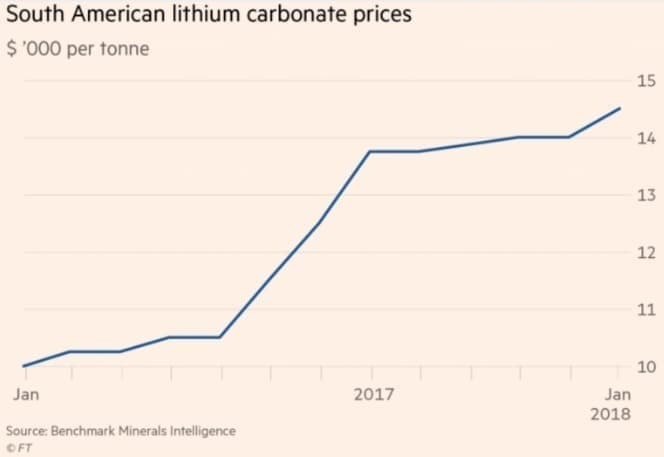 Chinese companies now own major shares in many South American lithium mines, where the bulk of the world’s lithium is produced, in order to feed Chinese battery factories. European investors are searching out lithium deposits in Germany and the Czech Republic. Meanwhile, drillers are mapping out underground lithium deposits in the UK, Portugal, and Sweden. Canadian lithium deposit, according to Selway, represents a “sleeping giant:” once tapped, it could provide enough lithium to satisfy North American demand. Magna International (TSX:MG) (NYSE:MGA) is based in Aurora, Ontario. The global automotive supplier is gutsy and innovative–and definitely tuned to the obvious future–clean transportation. A great catalyst is its development of a combo electric/hydrogen vehicle–a fuel cell range-extended EV (FCREEV). It’s not going to produce them (for now, at least) but plans to use the model to show off its engineering and design prowess and produce elements of the electric drivetrain and contract manufacturing. Oh, and self-driving cars … definitely a huge part of the innovation in energy and artificial intelligence. As an early entry into the self-driving car world, Alphabet’s innovations have paved the way for a transportation revolution. This article was first published in the Oilprice.com, and is being reproduced under a special arrangement. Click here to go to the origina. Previous Is Pakistan Running Out of Water?